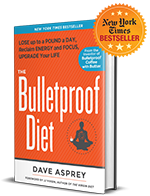 Vitamin D isn’t just the most important supplement – it is possibly the most important biohack. Vitamin D acts on over 1000 different genes and serves as a substrate for hormones like testosterone, human growth hormone, and estrogen. Contains 5,000 IU of D3 with 100 mg of Certified Organic Coconut Oil to aid in absorption. Vitamin D3 is a highly bio-active form of vitamin D. Vitamin D3 supports normal function of the nervous system, immune system and musculature. Vitamin D3 helps reducing the risks of falling,that relate to postural instability and muscle weakness. Falling is a risk factor for bone fracture in men and women over the age of 60. The beneficial effect is obtained at a daily intake of 20 micrograms vitamin D from all sources. 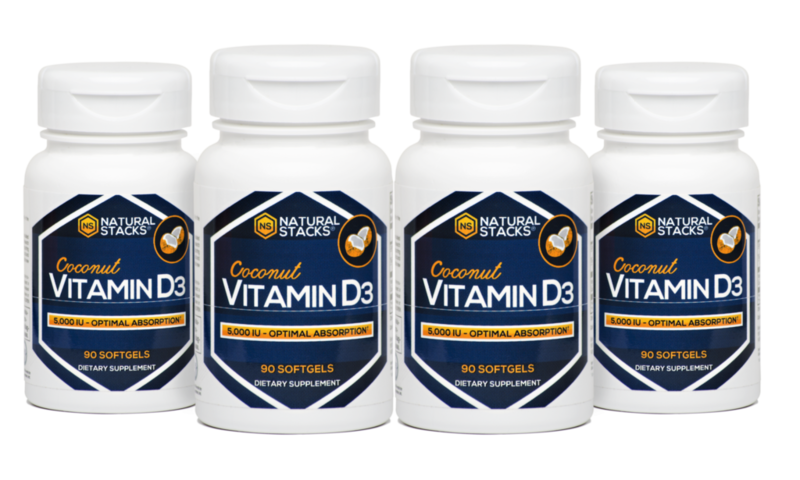 Vitamin D3 also functions as an important prohormone that contributes to the process of cell reproduction and the maintenance of strong bones and teeth. A prohormone is a hormone that improves the effect of existing hormones. Because of it’s vital importance and lack of dietary sources, humans evolved to be able to make Vitamin D on their own. Ultraviolet (UV-B) radiation from sunlight penetrates the uncovered skin and naturally gets converted into Vitamin D. Season, time / length of day, cloud cover, smog, sunscreen, and darkness of skin all affect the amount of UV exposure and rate of Vitamin D synthesis. It’s been shown that cloud cover and pollution can reduce UV energy by up to 60%, and UV-B radiation doesn’t penetrate glass, so exposure to sunlight through a window does not produce Vitamin D.
Natural Stacks™ Vitamin D3 provides the highly bioavailable form of natural Vitamin D (Cholecalciferol). 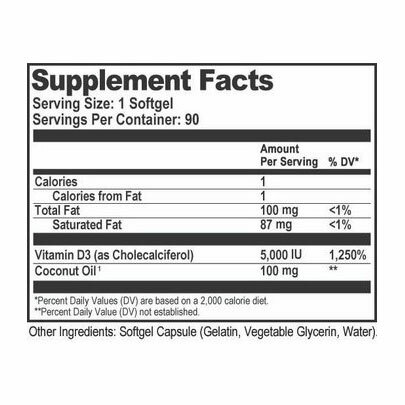 To ensure optimal absorption of this fat-soluble vitamin, we suspended it in organic cold pressed coconut oil. The natural fatty acids in coconut oil aid the transport of Vitamin D into the bloodstream for fast and effective results. 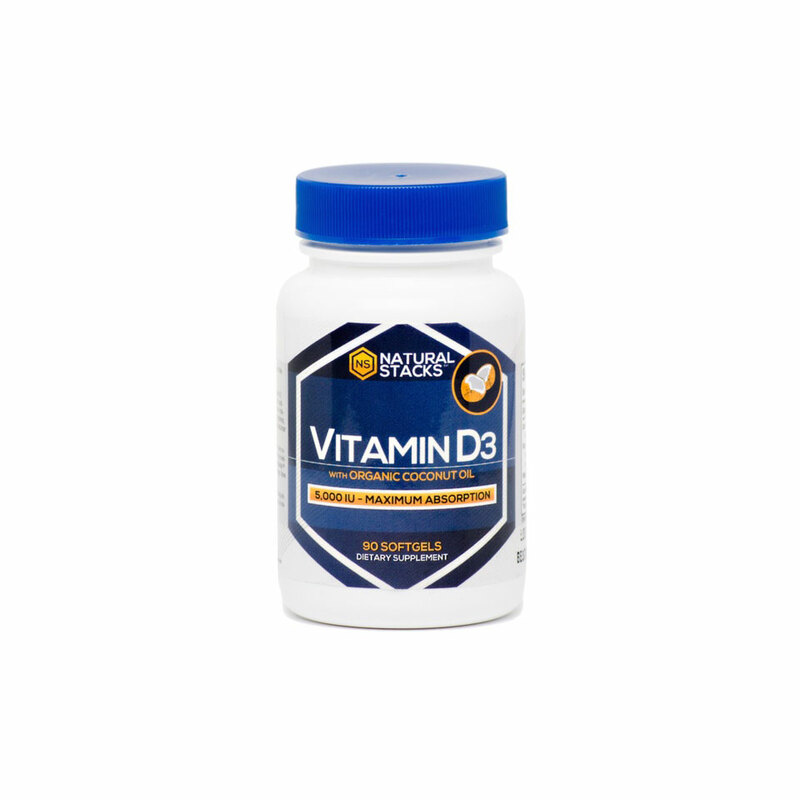 Vitamine D3 is a dietary supplement that falls within the category of vitamines. Suggested Use: Take 1 soft gel per 2 days, preferably in the morning, or as directed by a healthcare practitioner. This supplement is not suitable for children under 10 years. Our suggested Use differs from the label of the producer because of Dutch legislation. The maximum allowed dosage per day is 75 micrograms. This product contains 5000 IU which is the same as 125 micrograms. Other Ingredients: Softgel capsule (glycerin, gelatin, USP purified water). Not suitable for children under the age of 11. Putting organic coldpressed coconut oil together with vitamin D in one supplement is probably the best way possible to increase your Vitamin D levels. This is because vitamin D is a fat soluble hormone and, when you understand how vitamin D is needed for efficient cellular communication, immune, muscle, heart, bone and brain health, taking Natural Stacks’ vitamin D is a No-Brainer! Great product ! I had a slight problem with delivery, emailed customer support had quick response and quick delivery on the back side. Will continue to order my Vitamin D3 here. Very good product. Like knowing there is a very good oil in the vitamin. This stuff is the best. It’s not harsh on your stomach like other creatine out there! Does exactly what it says on the tin! I take it after my workouts early evening, same time on non-workout days! Nice to find D3 5000 quality product at a decent price. Trusted supplier , great products, expensive , but you get what you pay for.